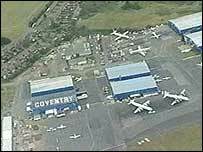 Warwick Council will not to pursue an injunction to prevent Coventry Airport using a temporary passenger terminal, it says has no planning permission. The authority has spent tens of thousands of pounds in legal costs and now says it will concentrate its efforts outside the court room. In May, a High Court judge threw out its action, calling it "draconian". The council has decided not to appeal but will concentrate opposition through normal planning processes. The authority had argued planning permission was needed for the terminal - a claim rejected by the airport. The High Court ruled that the council's application for an injunction was an "abuse" of the court process and struck out the action. Mrs Justice Gloster said at the hearing there was no reasonable prospect of a trial judge granting a permanent injunction, adding that the procedure adopted by the council was "wholly inappropriate". The decision meant Thomsonfly could continue to operate from the site. A council spokesman said on Thursday considerable time and expense would be required to pursue further court action. "The council has reviewed its position and concluded that it would be better, in the wider public interest, not to pursue the injunction and instead concentrate on other areas," he said. This includes dealing with the current planning application for the permanent terminal.